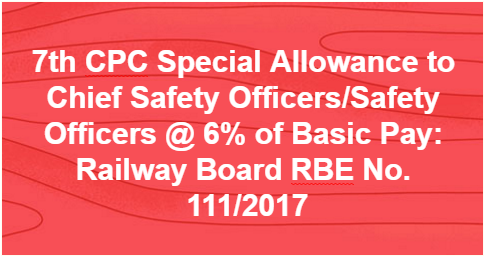 New Delhi: Government of India, Ministry of Railway has issued orders regarding Implementation of recommendations of Seventh Central Pay Commission accepted by the Government - Special Allowance to Chief Safety Officers/Safety Officers on 30 August, 2017 to The General Managers and Principal Financial Advisers, and All Indian Railways & Production Units. Consequent upon the decisions taken by the government on the recommendations of the Seventh Central Pay Commission relating to revision of allowances, the President is pleased to decide that Senior Supervisors of workshop cadre (whether working in workshops or PCQ) when deputed as Chief Safety Officers/Safety Officers may be granted Special Allowance @ 6 percent of Basic Pay. The revised rate of allowance shall be admissible with effect from the 1st July, 2017. All other terms and conditions envisaged in Boards letter No. E(P&A)I-2008/SP-l/WS-1 dated 04.07.2008 shall remain unchanged. Senior Supervisors of workshop cadre (whether working in workshops or PCQ) when deputed as Chief Safety Officers/Safety Officers may be granted Special Allowance @ 6 percent of Basic Pay.